Hiking or fishing be sure to try the dishes prepared on a fire. Soup, porridge, baked potatoes - in nature these simple dishes are especially tasty. Note that all consumers will almost certainly require supplements, so taking out of the house more products. 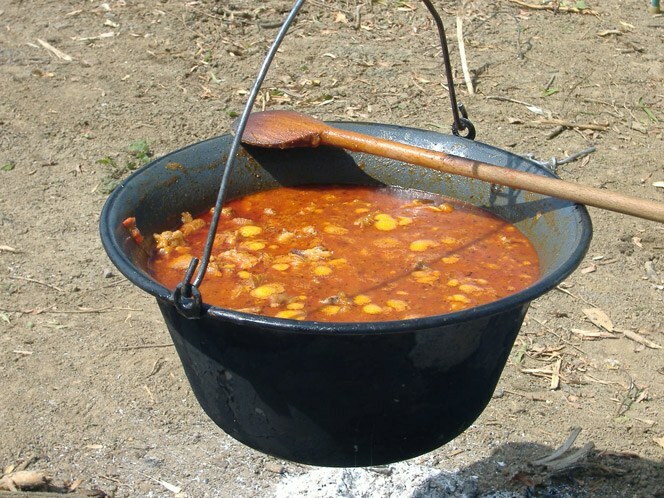 One of the most popular camping recipes - a thick meat soup. So it is more hearty, add in soup, stew, greens and various spices. Pre-calculate the number of products. One portion will need 1.5 cups of water, 1 potato, a quarter of the carrots, 1 tablespoon of grits and a quarter cans of canned meat. In a pot pour water, add salt, add 2 onions and the chopped carrots. Close the pot lid and wait until water boiling. Remove the foam, add the coarsely chopped potatoes. Try the soup and the sunflower. Rinse millet cereal, rice or buckwheat and place it in a pot. Move it so that the water boiled less rapidly. After 10 minutes put the soup, canned meat, Bay leaf and pepper. Simmer for a few minutes, stir in the chopped parsley and dill, sprinkle with freshly ground black pepper. Ladle the soup into deep bowls and serve with black or multi-grain bread, cut into thick chunks. Fishing donate part of the catch for cooking this soup on the fire. According to seasoned tasters, the taste is fundamentally different from the fish soup, cooked on the stove. Put the cauldron on the fire, pour 5 liters of water. While it boils, peel and gut the fish. Be sure to remove the gills, otherwise the ear will taste bitter. For a hearty soup takes 5-6 fish size of about 10-15 cm more diverse set of fish, the tastier it will turn out ear. Peel 3 carrots, 8 potatoes and 2 onions. Potatoes coarsely chop the carrots, chop the slices. In boiling water omit the potatoes and cook until done, periodically removing the foam. Add the whole onions and fish. If the fish is large, cut it, put a small whole .Wait until water again begins to boil, again remove from the soup and foam. Let the fish cook for 5 minutes, add to soup salt and freshly ground black pepper. Optional finished dish can be sprinkled with chopped herbs. On the fire you can prepare a hearty dish, perfect for Breakfast or dinner. Thoroughly wash 1 kg of millet, put it in a pot of boiling water. Close the container lid and allow the grits to simmer for 5 minutes. Then drain the water. This operation will remove from millet the bitterness that spoils the taste of the porridge. Pour the millet 3.5 liters of hot water from the kettle, add 1 tablespoon of salt, a can of condensed milk and 200 g butter. Mix the porridge and cook it for 10-12 minutes. Remove the pot from the heat, wrap it in a blanket or thick towel. Let stand half an hour, and then lay porridge on plates. It is lush, crisp and very tasty.